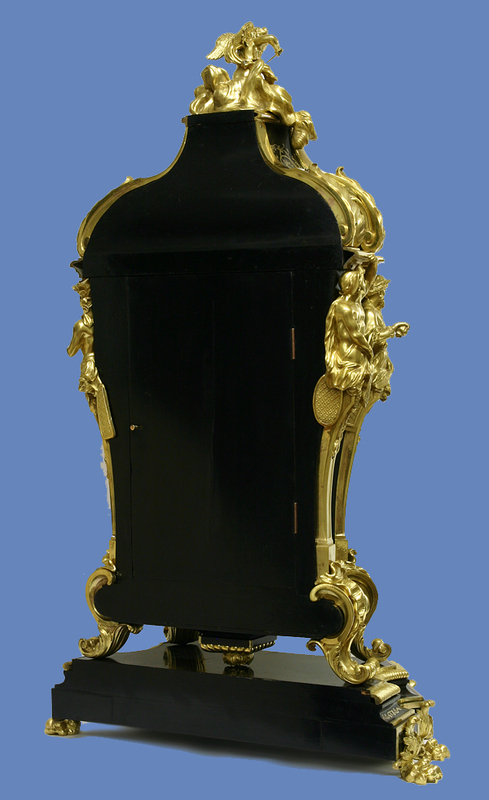 The elaborately shaped ‘premiere partie’ clock case and base feature ebony and tortoiseshell veneer with engraved brass inlay. It is extensively decorated with cast ormolu mounts that include heavy molded edges, multi-piece leaf scrolls for the clock feet, the four continents to the protruding corners and an urn emitting plumes of smoke to the back door. Above sits cupid drawing back an arrow while seated on a bank of clouds and the whole stands on six bold claw feet. 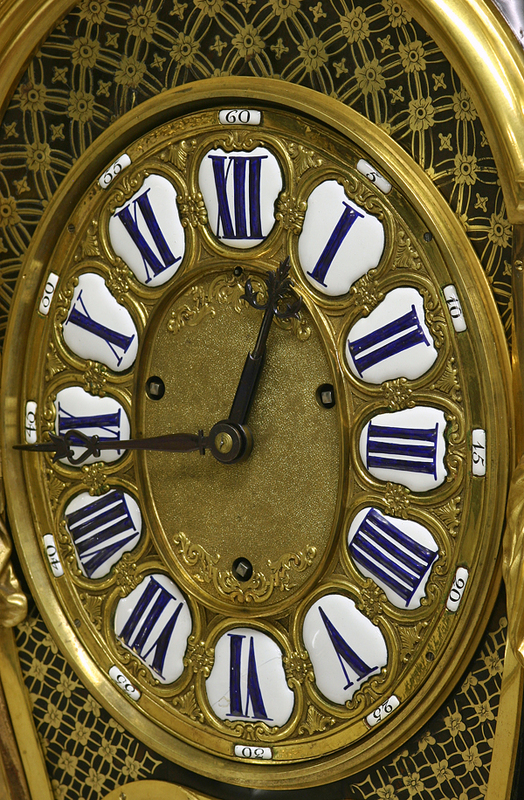 The extremely unusual cast ormolu oval dial has a matted center, cartouche numbers with blue Roman numerals for the hours, Arabic five minute marks, the fast/slow adjustment just below the 12, a glazed oval bezel and large elaborate steel-cut hands. 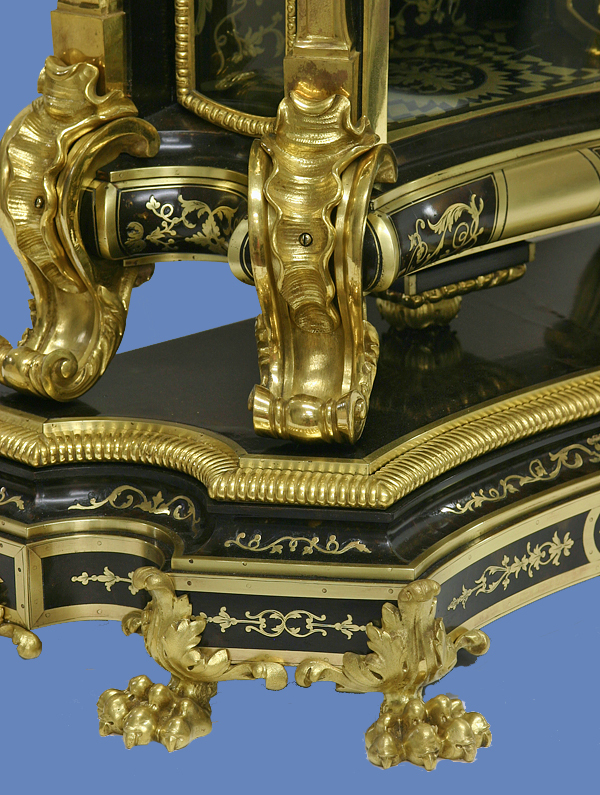 The multi-piece hour hand rides along a protruding edge and changes length to retain the desired proportion between the end of the hand and the hour plaques. 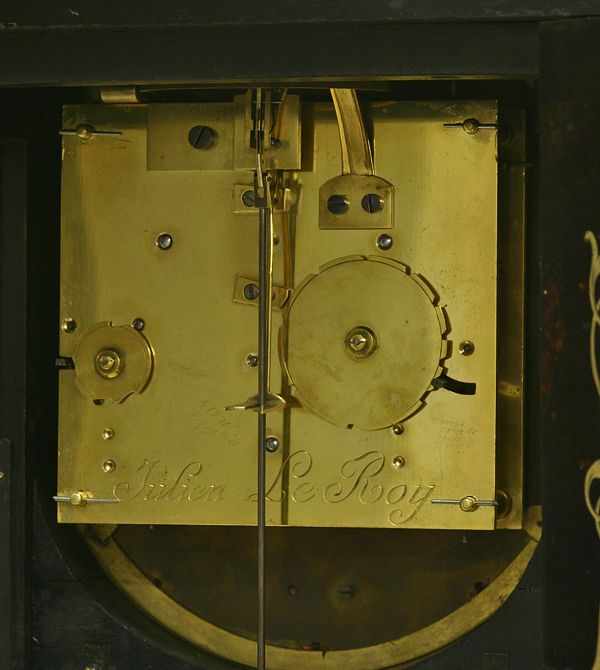 The large square three-train eight-day period-style movement has baluster shaped posts, a pendulum with a steel rod and brass lenticular bob, a Brocot suspension, two hammers striking by torsion on a pair of bells mounted above, large and small countwheels for the hours and quarters and has ‘Julien LeRoy’ engraved across the backplate. 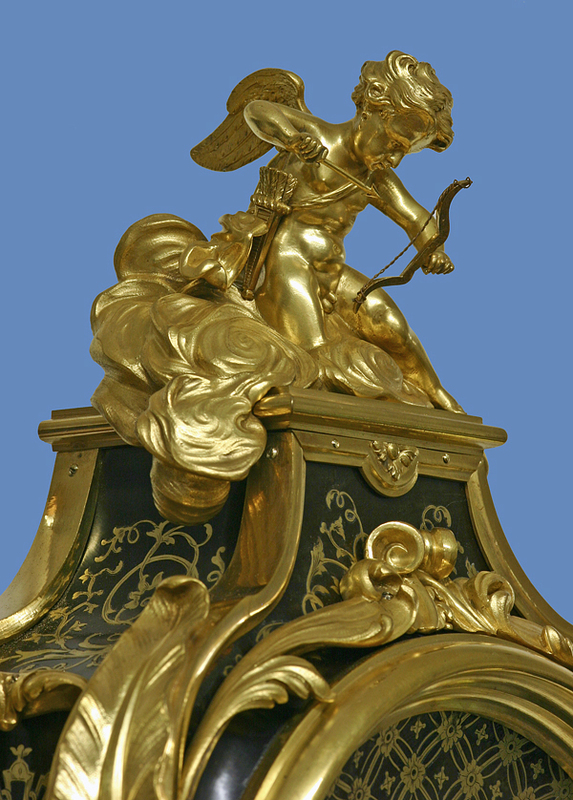 During this period it became popular by some of the leading firms including Linke, Zwiener and Vion to make replicas of some of the great pieces of the Louis XIV and XV periods. The replicas execution, right down to signing the pieces with the original makers signatures, were so close to the original pieces that they are often mistaken to be period. They were, however, not intended to fool. 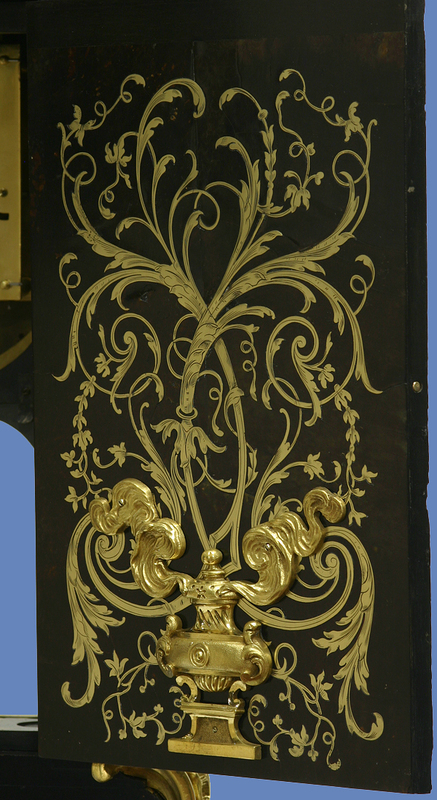 Not only were contemporary techniques used in the production, but often they also carried the makers marks as in this case where the backs of the bronzes have ‘HV 630’. Oval dials are extremely rare. They were first introduced in this model by Andre-Charles Boulle and Gilles-Marie Oppenord and require the hour hands to compensate for the shape of the dial. Henry Vian (1860-1905) was a celebrated bronzier who specialized in the production of bronzes in the eighteenth century style, particularly light fittings. He participated in the Great Exhibitions of 1878, 1889 and 1900 and received a Gold Medal in 1889. His workshop was based at 5 rue de Thorigny in Paris. His wife and son ran the business after his death in 1905 until 1944, when the city of Paris took over the premises for the l’Ecole des MÃ©tiers d’Art. The four continents: Europe, Asia, America and Africa, were the ones acknowledged during the early 18th century. Each of the figures is clothed and carrying weapons associated with those parts of the world. 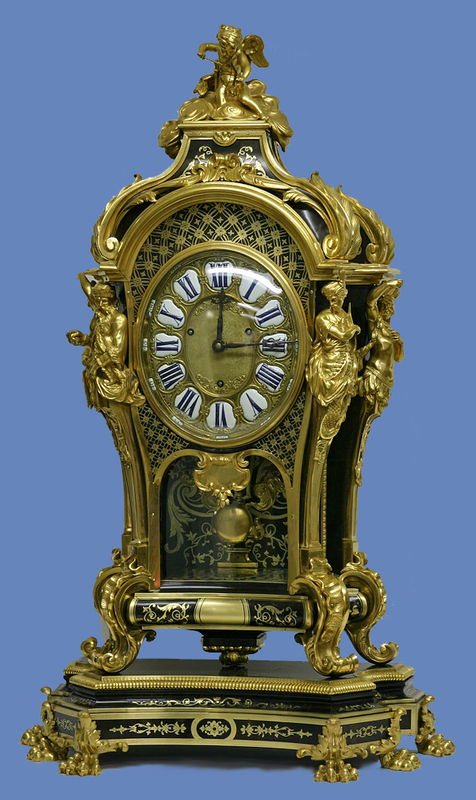 There are only a handful of both period and Victorian examples of this model documented and a couple of these have had the oval dial replaced with a round one. J Paul Getty Museum: Considered an original example until proven not to be period. 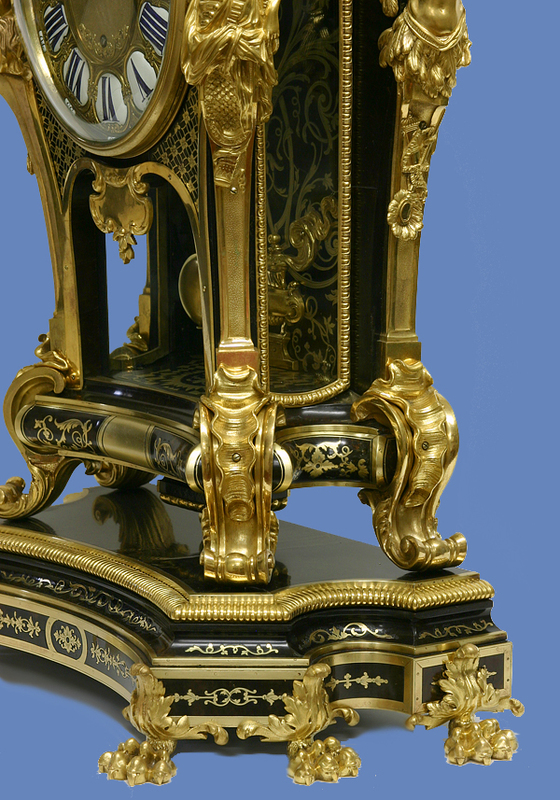 The photo of the clock is on the cover of ‘Clocks, French Eighteenth Century Clocks in the J. Paul Getty Museum’, 1976. 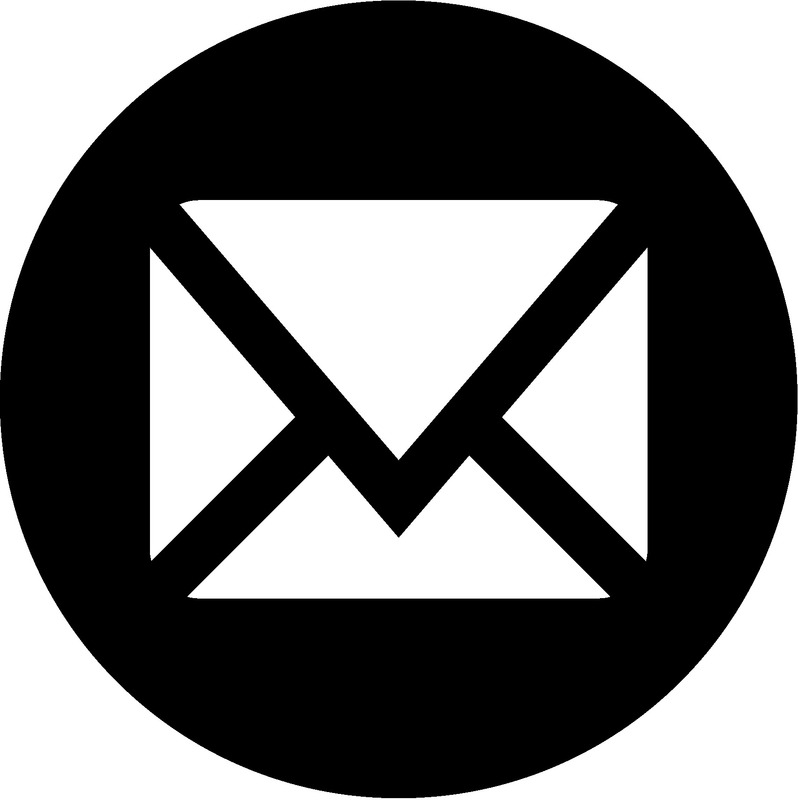 – Oval Dial. 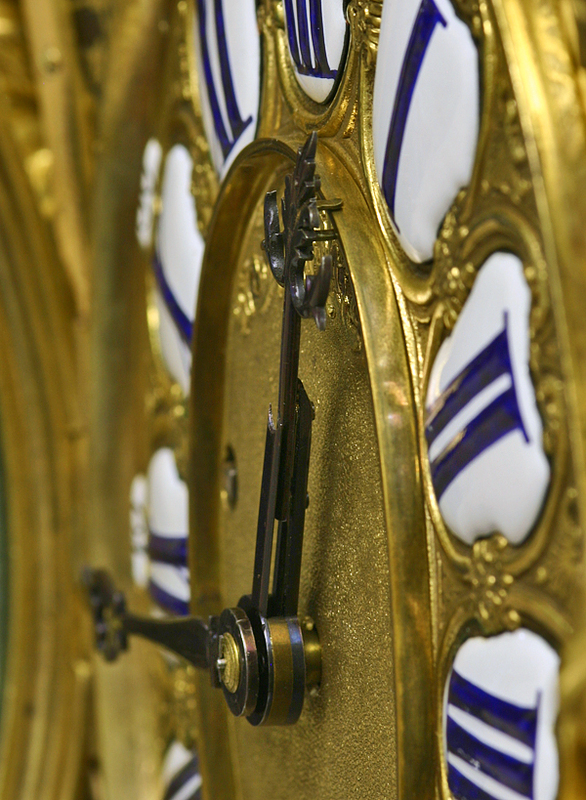 Wallace Collection, London – Replaced dial. Bibliotheque l’Arsenal, Paris. – Original dial. Detroit Institute of Arts – Original dial. 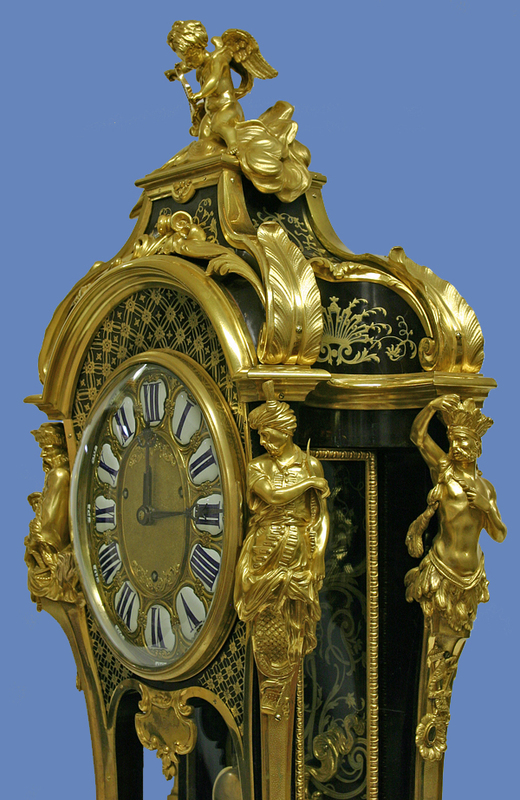 Waddddesdon Manor – replaced dial. 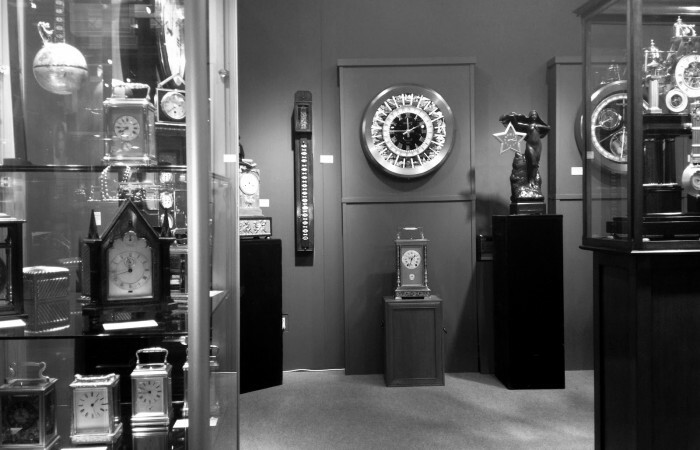 In a contemporary photo of one of Vion’s showrooms against the back wall. Assumed oval. 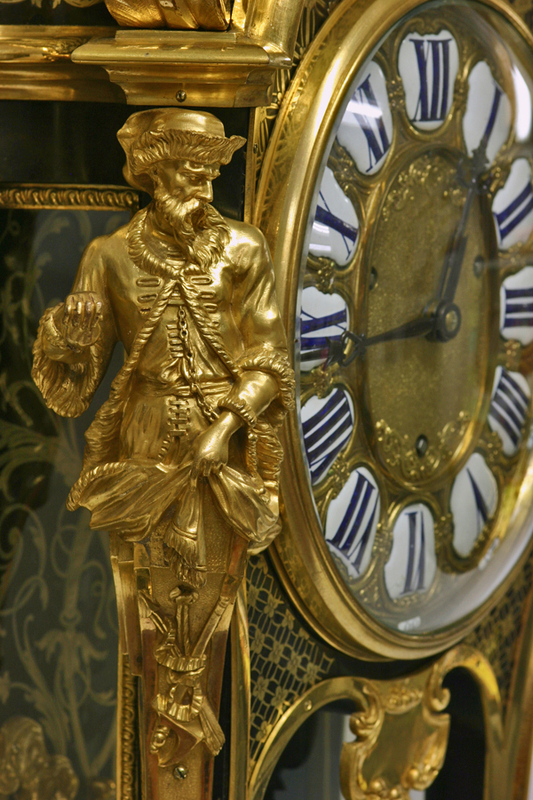 Although the clocks themselves are very similar, this is the only example we’ve found that does not stand on a pedestal, but a matching table top base.